As our frequent readers surely know, Coventry City left their previous home in spring 2013, following serious dispute with Ricoh Arena operators. The club claim they need a stadium to call their own and have since played in Northampton. Now they show what they hope to build within the next few years. 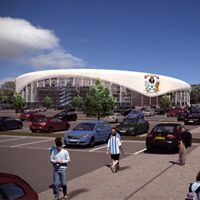 New stadium for Coventry City is to be built as a phased development, most probably in three phases. The renderings presented in December 2013 show how it should look once finished, with capacity at the final 23,000 level. However, CCFC hope to move in to a stadium already at half the capacity. It should then be expanded to 17,000 and eventually to 23,000 as demand grows. The final size caused some controversy after moving from much bigger Ricoh Arena and proposing a smaller stadium. The club argues that it's sufficient and realistic, even with a Premier League promotion in mind. 11 skyboxes were also planned (10 with 12 seats each and one for 24 people), as well as a 100-seat restaurant overlooking the pitch. A 430-seat banqueting hall is to be located behind the main stand. The initial concept was created by a joint team of AFL Architects and S&P Architects, two practices with significant stadium portfolio. The façades are to significantly uncover what's inside, welcoming fans. At the same time the roof should keep atmosphere inside. Worth noting, the initial renderings presented may differ from the final shape of the stadium as fan consultation is to follow and the site for the stadium needs to be established. Though we placed the stadium in Coventry for database purposes, it's expected to be “very, very close” outside of the city with two sites being examined, each between 30 and 50 acres. This should fit both the stadium and training base which the club want to have close at hand. Only after the land is obtained can the club file their planning application, estimating further 18 months may be needed to break ground on the stadium. Thought neither the land nor time line are set so far, total cost is expected to stay within the £20 million.